This review is written by Ankita Mukherjee and is a part of guest post exchange. Set in the country of Nigeria, Purple Hibiscus tells the story of fifteen year old girl Kambili caught in a world of absolute authority and tyranny where freedom of speech is punished and deplored. The novel opens with Kambili telling us how and when things started to fall apart at home – her family. And reflected in the image of her shattering family is the ever-worsening situation of her country. Kambili lives in an era when her country Nigeria was in a state of disintegration – bogged down by the tyrannical rulers of military coup, it was hopelessly trying to get up and govern itself. And yet perhaps, the state of her country is less appalling than her crumbling family, mutilated time and time again by the whims and fancies of a person who was worshipped outside his home. Kambili’s papa was much respected in his town for his generosity to the church and community, his commitment to democracy, his advocacy for freedom of speech as well as his devotion to Christianity. And yet at the core of such a person lived a tyrant who abused his family for mildest of transgression from his expectations. Living amidst such fear, Kambili still adored this man, and lived for his approval alone – until the siblings’ life was changed by one trip to their Aunt’s home. The characters come alive with their complexity and singularity. While some may find Kambili’s shy and silent demeanor unsuited for a heroine or protagonist, I personally think, it was what opposed her from her cousin Amaka’s personality that made the narration unbiased and believable. 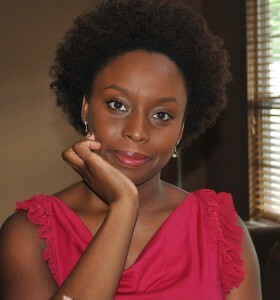 Furthermore, her character could not have been a stand-alone and that is where the other characters like that of her mother, her brother – Jaja, Aunt Ifeoma or her cousins come out to support the story. It is the relation between the characters that tied the story end to end. The work is sprinkled with imagery and metaphors much like you would find in Arundhati Roy’s books. Christianity in its different forms occupies a predominant part of the story. The novel depicts a picture of Nigeria where intellect of educated middle class clashes against despotism of the militia, where modern and tradition stand in conflict, where opulence and poverty exist together, where love can still blossom in the thick of devastation. I will not say that it is an easy-read but I will say that it was worth it. As readers, we are used to the stories that clearly define the black and white of morality; Purple Hibiscus is not one of them. It raises the question – what constitutes morality, can there be a situation where murder is forgivable, and can a person be moral as well as immoral? It offers a window to the complexities of real life where the shades of grey are a much more familiar than their extreme counterparts. 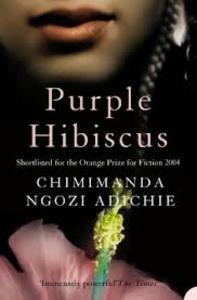 At the core of the book is a story of defiance, of imperfection shrouded by morality, of choices that changed lives, of a family that imploded, of hopelessness and desperation, of struggle against one’s own demons, of strength hidden by obedience – and the story of a purple hibiscus that dared to bloom stubbornly in the devastated land abounded by its red brethren. Watch the trailer of the book here.